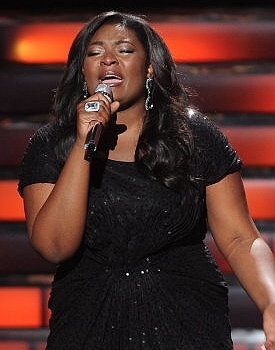 Watching Candice Glover win American Idol last night was like watching one of my own kids. Like Sara and Simeon, Candice is Gullah Geechee, born and bred. I don’t know her. Though she went to school with my daughter and was born and raised on the same island that my husband calls home, the American Idol stage was my introduction to her amazing talent. Even with the standard speakers on my television, her voice sends chills up and and down my back. When she sings my husband acts like he’s in church, complete with the occasional “Hallelujah” and praise dance. She’s that good. I’m proud of her. But even more than her fabulous voice, I’m proud of her commitment. This was her 3rd time. Each time she was rejected, she gathered herself and went back again. I’m not sure I would have had the guts to do that. But she did. She would not give up. Last night we saw the results of that belief in her dream, herself and her God. It’s been on my mind all day. What if after the first try she hadn’t been willing to risk it again? What if after the second she had convinced herself that she didn’t have what it takes? That maybe this wasn’t God’s plan for her. After all, if this was what she was supposed to do wouldn’t it have been easier? Even more than her amazing voice, THIS is the example I want to hold up, not just to my own children, but to all the children I encounter. If you have a big dream, go for it. And don’t give up. So okay — I thought that was the lesson. After all, it’s a good one. But just as I was starting to feel all smug and sermon-y, another question popped into my head. Was I dreaming big enough for myself? This thought startled me. I mean, I’m a middle-aged woman, for goodness sakes. I’ve had some success and I know what failure feels like. I’ve done my gig. I’ve raised my kids. Sure, I have some dreams and expectations, but, at this point they should be reasonable. Right? Right? But what if that’s NOT right? Have I stopped having Big Enough Dreams for myself? This scares me a little. I want to push it away, but it won’t let me alone. And once again I find that my kids, even the ones I’ve only met through the TV screen, have something to teach me, if I’m willing to learn: There’s no statute of limitations on Big Dreams. You are so right! As long as we are alive, we should continue to have SOMETHING to dream about….SOMETHING to strive for. I too admire Candice’s fortitude, not just for her not giving up, but for the way she carried herself on stage, and believed that she was just as beautiful as the “skinny” girls. She ROCKED with confidence and I loved it! America loved it. America loves Candice! Absolutely! She knows she’s beautiful in every way that counts. Another lesson for us all! Well said. She’s such an inspiration! But you are too! You can’t underestimate the importance of the second half of your handle: mama! Thanks Kami. I find myself in an interesting place with my “Mama” role. Still learning as I go! I was just thinking about this last night! She performed with Jennifer Hudson, and I thought about Jennifer’s persistence. She didn’t even win, but became more popular than a lot of the people who did! Then, I thought about my dreams. I have one semester left in college. I had a newborn in February, and I was full time in college. I also have two other children. It was a hard semester, but I made it with all A’s and one B. I feel like determination is the key, no matter what obstacles may come. I was rooting for Candice, and I’m excited that she won! Congratulations on your perseverance! I’m rooting for you too! I just wanted to say thanks for the dream you and your husband had regarding GGI. We have just “discovered” this show on Amazon Streaming. My children ages 3-7 years old as well as my 13 year old enjoy watching. It is on everyday in my house. I appreciate the model of family and community that you put forth. So thank you again! I love that children are still discovering GGI! It’s nice when good things live on for new generations. Thank you.